As the temperature climbs higher, many of us begin thinking about that much-needed and much-anticipated summer vacation. It brings to mind breezy outfits, a trip to the beach, a dip in the pool, and delicious tropical food. And while our busy schedules make it difficult to find a day or two to go on a trip, you can go on a tropical escape over lunch at Jollibee with the return of the Amazing Aloha Yumburger. 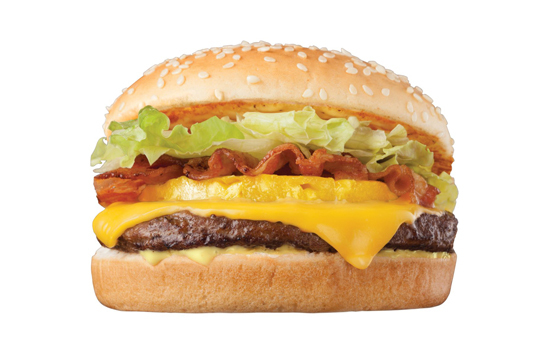 “Since its first launch in 1996 and its much-requested return in 2013, the legendary Amazing Aloha Yumburger has always been one of our most popular limited-time offerings,” said Cathleen Capati, Jollibee Assistant Vice President for Marketing. “The perfect combination of sweet and savory flavors in a burger, plus the varying textures, truly fit the Pinoy palate. The Amazing Aloha Yumburger is definitely one of our unique, adventurous offerings—and if you haven’t tried it yet, this summer is the best time to be swept away to a tropical vacation with every langhap-sarap bite!” she added. Say Aloha to the burger indulgence of the season – the Amazing Aloha Yumburger will return to all Jollibee stores nationwide starting April 1, 2019, in single-patty (P85) and double-patty (P115) sandwiches.